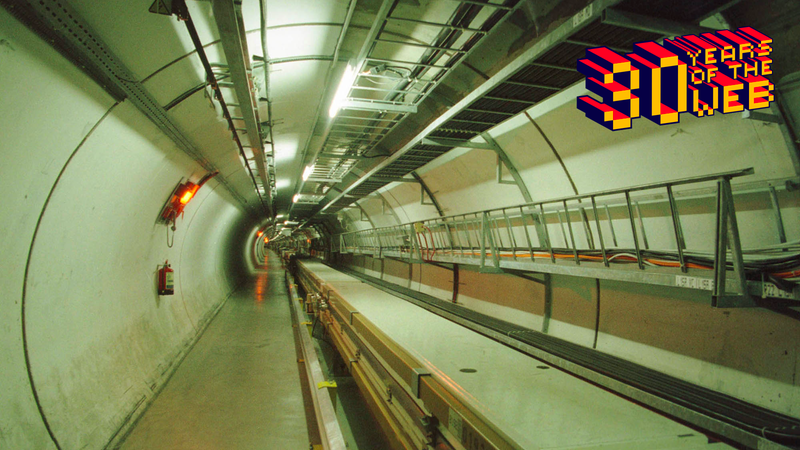 Interior view of Large Electron Positron Collider at CERN in 1997. 30 years ago this month, Tim Berners-Lee penned his original proposal for what would become the World Wide Web. At the time, he was working at CERN, the high-energy physics lab in Geneva, Switzerland best known these days for operating the Large Hadron Collider. In many histories of the web, this fact is treated as a footnote, but it was specifically the messiness of international scientific collaboration that spurred the creation of the space we live much of our lives on today. You might wonder how Berners-Lee’s idea for a “web” of documents accessible through a “hypertext browser” would help slam particles together in order to uncover the universe’s secrets. In fact, it wasn’t hard physics problems that inspired Berners-Lee. Instead, it was the inefficiencies of working in a large collaborative environment, one that brought together physicists from hundreds of laboratories in dozens of countries around the world. Trying to manage all of the engineering diagrams, instructions, and graphs that come with operating high-energy experiments was no simple task. “It was a tremendous mess,” Peggie Rimmer, Berners-Lee’s supervisor in CERN’s Data and Documents division when he invented the web, told Gizmodo. She said they were working with a variety of computers, networking protocols, emailing services, and lines to various universities. Decades before the Large Hadron Collider was completed, another collider called the Large Electron Positron Collider occupied the same 17-mile tunnel. In 1989, Berners-Lee was a member of a small group charged with getting data out of that experiment’s detectors and onto physical storage devices. There was an increasing need to develop standard software to manage that data given the size of the collaboration. In addition to the scattered computers on which documents were stored and from which emails were sent, there was a hodgepodge of lines between CERN and other labs. These “leased lines” were maintained by individual telecommunications companies around the world. In this environment, Berners-Lee hoped to apply the ideals of standardization championed by Rimmer and her team to the piecemeal networks. Rimmer remembers a “huge need” for an easy way to exchange the documents that come with being a physicist. At the same time, CERN was built on an ethos of open source from its inception, which carried into Berners-Lee’s proposal. CERN was the perfect environment for creating the World Wide Web as it exists today. Rimmer said that the team’s priority was handling the LEP data, and Berners-Lee mostly worked on his “Information Management” proposal on his own time. Still, she explained to Berners-Lee that for the idea to have legs, it would require a standard set of simple definitions and rules underpinning it so that it would be easy for anyone to use. This led to the World Wide Web—it’s not the internet, but a series of rules that define how we use the internet. If the internet itself is a network of roads, then the World Wide Web are the laws that allow people to use their cars. Webpages are essentially documents with an address, called Uniform Resource Locators. The webpage’s content can contain links to other webpages and clicking these links will send you to another webpage with its own URL and more content. Though Berners-Lee developed backend software for the World Wide Web and the first web browser in his home in 1990, it wasn’t a huge hit among particle physicists initially. After all, it was primitive, only ran on a few machines that most people didn’t have, and there was nothing on it. Those who did adopt it used it as a document repository for text-based things like phone numbers and meeting minutes. But scientists eventually began putting more documents onto the web. And its use grew beyond the science environment after the release of the Mosaic web browser in 1993. The browser convinced people that the World Wide Web could be used for more than just scientific documents—it was a place to unload whatever you wanted to and link to whatever else you wanted. That same year, CERN announced the World Wide Web would be free for anyone to use, and soon its popularity exploded. The World Wide Web’s invention represents perhaps the most important non-physics development at a high-energy physics lab—but its need didn’t come from physics itself. Instead, it was the desire for standardization to support CERN’s global community that necessitated such a tool. It’s easy to look at the internet today and just see echo chambers, silos, oppressive governments, and big corporations, but we’d do well to remember that the web that changed the world was founded on the principles of being collaborative, open, and free. Correction: A previous version of this story described Berners-Lee as a “non-physicist,” which is inaccurate. Instead, it was the web itself that was a “non-physics development.” Additionally, Rimmer clarified that her comment about “10 different computers” at CERN was a figurative statement and alerted us to the use of the incorrect pronoun when referring to her team. We have updated the wording and regret the error.